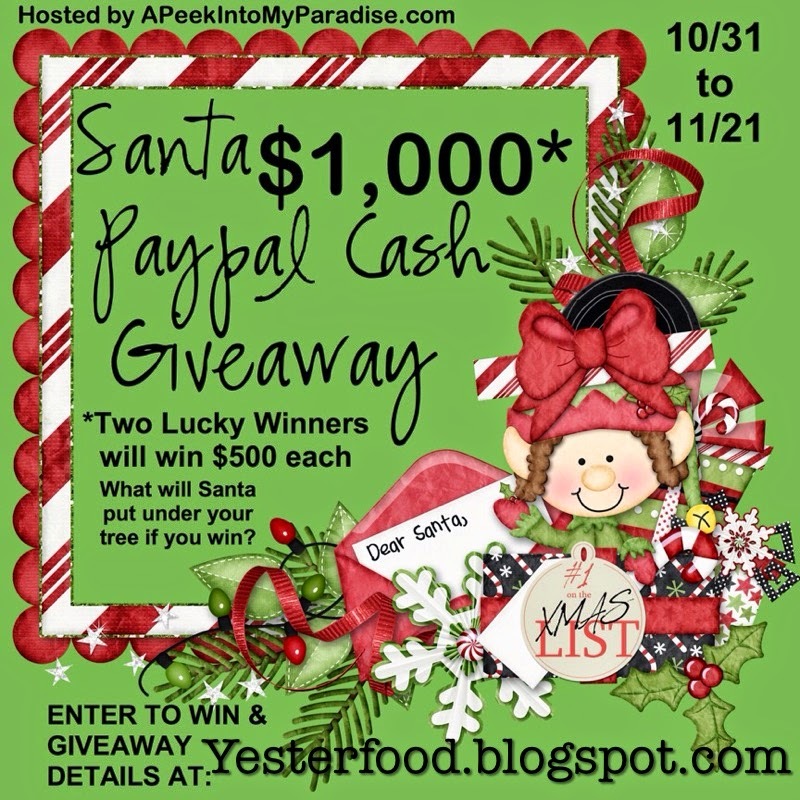 Yesterfood : Santa PayPal Cash Giveaway! Santa $1,000 Paypal Cash Giveaway! Thanks to some amazing friends and supporters of A Peek Into My Paradise we were able to come together collectively with a CASH PRIZE of $1000, which will be awarded to two very lucky winners of $500 each through Paypal Cash! YOU could win $500 Paypal Cash! Brought to you by these phenomenal co-hosts! Now go enter, and good luck!! Hi Joy! Happy Friday! Great giveaway! A couple new pair of shoes! If I win - I'm hoping to get some new clothes! You always have the best giveaways. Thanks so much for a chance to enter. With that kind of money, I'd have the happiest Christmas I've had in over a decade. New tablet would be great. I hope Santa will put a new computer printer and a kindle fire under the tree. i hope to get a new coat! I don't understand why some of the pages I liked (e.g. secondchancetodream or Ellie Petrov) still appear to be visible only to me, when I made all my "likes" Public? The rest are all set to Public, except for these two O.o Weird.